Ten of Alaska’s collecting institutions, in eight communities from Unalaska to Fairbanks, have been awarded $76,154 in grants. The awards will support collections care projects through funds created by Rasmuson Foundation and administered by Museums Alaska. Established in 2013, the Collections Management Fund supports projects that advance the preservation of museum collections with awards of up to $15,000. The fund provides critical support for the care of objects documenting Alaska’s cultural and natural heritage. In April, Museums Alaska selected ten projects to fund. The funded projects include management of ethnographic collections and plant records, upgrading textile and basket storage, digitizing oral history tapes and movies, and two collections internships. The fund will offer additional grants in 2019. For eligibility information, application deadlines, and submission directions, please visit the Museums Alaska Collections Management Fund webpage. As the 2019 conference call for proposals deadline nears, take a moment to read the following article written by Elizabeth Walsh, recipient of a scholarship funded by the Donna Matthews Professional Development Fund to attend Museums Alaska's annual conference, held in Nome in 2018. I was hired as the Director of the Clausen Memorial Museum in Petersburg, Alaska in June 2018. As a small non-profit, our Museum functions within an intricate network of relationships. Such as the relationships between my staff, our Board of Trustees, and myself, as well as relationships with our community and other local institutions and organizations. These bonds strengthen our Museum and enrich our community. That the Museums Alaska’s theme for the 2018 Conference was Relationships perfectly suited my ongoing musings on how to get our community to actively engage with our Museum. The preconference workshop I attended in Nome opened my eyes to new roles our Museum can play within our community that will develop and strengthen personal connections to our Museum and its collection. I attended the half-day conference workshop hosted by Amanda Dale from the Alaska Humanities Forum. The workshop explored how to use our Museum’s collection as a springboard for conversation. By engaging in conversation we can foster stronger connections between individuals as well as between our community and our Museum’s collection. Using an item from a museum’s collection is an excellent tool for creating distance, which is sometimes necessary when discussing a contentious topic. Using a museum’s collection can also help equalize participants and create a shared experience that participants can then build on during the conversation. Museums are not just repositories of historic and old things. Museums hold living stories that still speak to relevant issues that are impacting our community today. This conference workshop focused on how to use our Museum’s collection to emphasize this aspect of museums. An important question I often ask myself is what can I do to help our community fall in love with their Museum? This in turn leads me to the question, what role does our Museums play in our community, and more importantly what new roles can our Museum take on that it hasn’t in the past? By nurturing personal relationships with our Museum’s collection, through conversation, I believe that our Museum can become a valuable resource for strengthening our community and exploring new relationships. My experience at the Conference in Nome has been instrumental to my growth as a Director of a small museum. I see a bright future for our Museum, one alive with stories both past and present. The Governor's proposed budget does not include funding for the Alaska State Council on the Arts (ASCA), which would eliminate the council from the Department of Education and Early Development. ASCA maintains the Alaska Contemporary Art Bank, provides grants to many museums in the state, and has been a strong advocacy partner on behalf of arts and humanities in Alaska. As members of the statewide museum community, your voice matters on this issue. You can reach your legislators by email, phone, social media, or mail. The American Alliance of Museums (AAM) maintains an Advocacy webpage that allows you to find your elected officials by entering your address. There you will find your federal and state elected officials, including address, phone number, and social media handles. "I support the Alaska State Council on the Arts, which provides valuable resources to the state of Alaska and my community. Please support the continuation of ASCA @[insert social media handle]"
You can also send a 50 word message to your legislators, using the link below. The House Finance Department of Education and Early Development (DEED) Subcommittee met on March 18th and 20th to vote on the governor's budget amendments. The subcommittee did not approve the proposed elimination of ASCA. Next, the Finance Committee will review the recommendations from the subcommittees and construct a budget. Take a moment to thank the members of the House Finance DEED Subcommittee. Write to the House Finance Committee to support the recommendation of the House Finance DEED Subcommittee to fund ASCA. Museums Alaska's Board of Directors has supporting ASCA as one of our top legislative priorities this year. Please be sure to subscribe to our digital mailing list to stay up to date on this and other advocacy calls to action as they occur. Museums Alaska maintains resources on our website to help you navigate the Alaska legislative process here. We will continue to share more resources and information as it becomes available. We also hold a monthly Advocacy Task Force teleconference meeting, that is open to anyone interested in advocating on behalf of Alaska's museums. Please join us! The following article waswritten by Alexandra Painter, recipient of a scholarship funded by the Donna Matthews Professional Development Fund to attend Museums Alaska's annual conference, held in Nome in 2018. In Marieke Van Damme’s conference Keynote “The Joy in our Work,” she addressed many issues about the daily work of museum professionals, and gave simple, yet practical advice on improving workplace culture. For me, the keynote was a refreshing reminder to take care of yourself. To produce your best work, it’s important to be refreshed. Van Damme noted that all museum staff members, at all levels, can help do this, and that it is a collective responsibility in improving workplace culture. One of my hopes in attending this conference was to leave with some advice on facilitating productive professional relationships. This keynote was a good reminder that good communication, gratitude, and kindness can encourage and propagate relationships with other staff and board members, as well as the community you serve. It makes sense that the better our relationships are at work, the happier and more productive we will be as employees. Instead of spending time overcoming the problems associated with negative relationships, we can, instead, focus on opportunities for positive connection. Ask colleagues how you can help them. Express gratitude to co-workers through a note or email. Be understanding and patient with those around you. All of these are straightforward suggestions, and can also be used in connecting with other institutions around the state. She noted that networking is about meeting other people, sharing knowledge, and making connections. It is an opportunity to expand support systems—the people you can rely on when you find yourself in need, and to reciprocate that support in turn. Moving forward, I hope to improve on existing collaborations and build on new professional relationships. I was excited to hear about all the great work and projects happening at the museums around Alaska at the conference, and feel energized to be involved. I extend my most sincere thanks to Museums Alaska, the Alaska Historical Society, and the people of Nome who worked so hard to put this interesting conference together. I look forward to seeing colleagues in Kodiak at the conference next fall. The Alaska State Office of Management and Budget (OMB) has issued a directive to the Division of Libraries, Archives, and Museums to look into divesting itself of the Sheldon Jackson Museum in Sitka, including the building and its collections, through sale. "The Sheldon Jackson Museum means so much to me. Please help protect these resources @[insert social media handle]"
Senator Bert Stedman of Sitka has spoken out about this issue and is quoted in several news articles in support of the Sheldon Jackson Museum. Take a moment to thank Senator Stedman. Museums Alaska's Board of Directors has identified the potential sale of the Sheldon Jackson Museum as one of our top legislative priorities this year. Please be sure to subscribe to our digital mailing list to stay up to date on this and other advocacy calls to action as they occur. Below is a copy of a letter sent on behalf of our Board of Directors to Governor Dunleavy's office. Please feel free to use the below template to write your own letter. The best letters address your personal connection to the issue, so please feel free to deviate from this template. The museum field is currently engaging in critical conversations regarding how our institutions can evolve to become more equitable, inclusive, diverse, and accessible. Topics of these conversations include (but are certainly not limited to): how to reflect the diversity of the communities we serve at the staff, board, and volunteer levels of our institutions; ways to include underrepresented or marginalized communities at all levels of the interpretation of history and culture; how to make inclusivity a key part of museums’ institutional values and culture; and how to work towards the systemic change necessary to be successful in these processes. These important conversations are as challenging as they are engaging, exciting, and forward thinking. Alaska museums have a responsibility to take on these important issues and discuss them in their communities and institutions as well as within our statewide community of professionals so that we may grow and improve together. It is through these conversations, and important work that must follow them, that we will shape the museums of the future. This year’s theme is inspired by the work of the American Alliance of Museums’ Diversity, Equity, Accessibility, and Inclusion (DEAI) Working Group. The working group published a report last year that provides five insights, each with a call to action, regarding the values of DEAI. The full DEAI Working Group report can be found here. We invite session proposals that explore the many interrelated issues laid out therein. This year's conference will be held in Kodiak September 25-28. Read the full Call For Proposals. As we begin planning for our 2019 conference in Kodiak, take a moment to read the following article written by Amanda Lancaster, a recipient of a scholarship funded by the Donna Matthews Professional Development Fund to attend Museums Alaska's annual conference, held in Nome in 2018. As not only a new Alaskan, but also a relatively new museum professional, I was most looking forward to the Museums Alaska conference as a way to finally put faces to names of people I had been speaking with for over a year. I was excited to meet people that loved working in museums, archives, and other cultural institutions as much as I love working in museums. It seemed fitting that the theme of the conference was Relationships. I was also eager to see Nome, a landscape so different from any I’d seen before. Museums in Alaska face unique challenges from those in the Lower 48, and so meeting with, and discussing common problems, was indispensable for me. It was reassuring to meet others that share similar struggles—when museum supplies cost as much to ship to Alaska as purchase, when the HVAC contractor has to fly in for a service appointment! The sessions, having the common theme of relationships, were very useful, as the Alutiiq Museum is purposefully trying to broaden its community support beyond our core circle of patrons. I strongly believe that in order for museums to survive in the future, they must engage more with the public and highlight history from below, an argument made by Dr. Lorraine McConaghy in her keynote address at the conference. Community conversations were a prominent theme across the conference, most especially in the Pre-Conference workshop, “Collections as Springboards for Community Conversations.” This workshop illustrated how well-situated museums are for making space for dialogue in the community, and facilitating what can be difficult conversations about community-wide issues. I have attended academic conference before, but this was my first professional museum conference, and it was immensely beneficial. 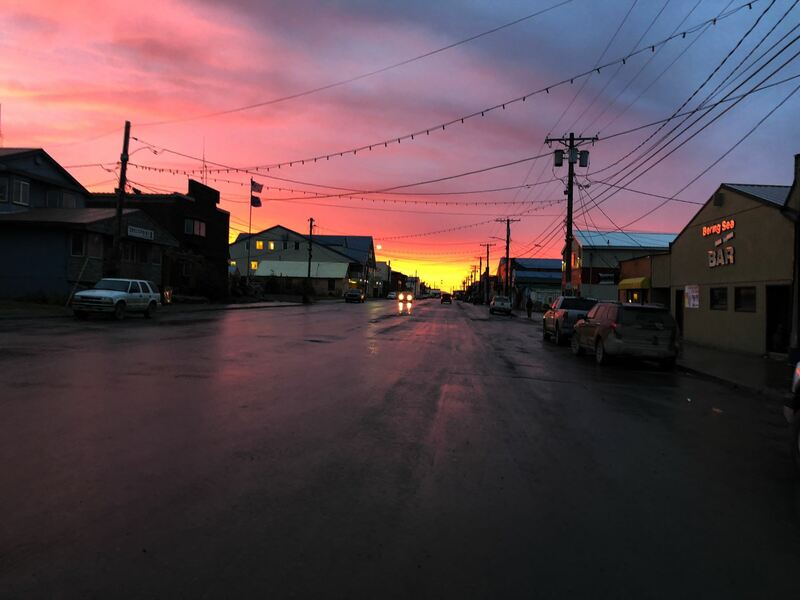 The conference had a very open, friendly feel, and the town of Nome was a wonderful host. It gave me the chance to meet people that I might not have, and I was able to visit a part of the state which would usually be out of reach. The Donna Matthews Professional Development Fund is a resource to which new museum professionals in Alaska are lucky to have access. After having met so many colleagues from across the state, I feel much more comfortable reaching out for advice about any concerns I have, and I look forward to next year’s conference in Kodiak. I look forward to showing people around my museum and Alaskan town.